The Swiss Franc, or simply Franc, has been circulating since the beginning of the 19th century. Between 1803-1850 they Swiss Francs become the officially currency in Switzerland. Swiss Franc is often referred to as the foremost safe heaven currency. It’s been considered as a safe & stable currency for over a decade and forex traders tend to flock to CHF when there is problems in other currency markets. How much are the Euro traded? Schweizer Franken (German), Franc Suisse (French) and Franco Svizzero (Italian) are the most common names for Switzerland’s currency. The short symbols used are CHF (‘the currency symbol for Switzerland’), SFR (‘official acronym’) and Fr (‘unofficial acronym’). The official countries using the Swiss Franc is Switzerland and Liechtenstein. Unofficially, it’s a viable currency also in Büsingen Hoch am Rhein, Germany. How much is the Swiss Franc traded? The official ISO code as currency traders are using is CHF. Fx trading offices can sometimes use Sfr instead of CHF. And finally, the Swiss themselves do often use FR instead, when dealing with the local currency. In 1848 the Swiss Federal Constitution became the only entity allowed to make money in Switzerland. 1850, they introduced the Swiss franc with the same exchange rate as the French franc. Swiss neutrality, banking system and legal system created a rule that at least 40% of the money should be preserved in gold reserves. This has led the country to be characterized as a ‘safe haven’ currency from the 1950s and afterwards. Anyway, the 1st of May 2000, rules were amend for how much gold the Swiss National Bank must keep. In March 2005, the National Bank had 1290 tonnes of gold in addition to the currency reserve, representing 20% of total assets. Switzerland is one of the few countries which has emerged from major currency crises. 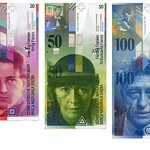 The Swiss currency has rather developed very strong throughout the later part of the 20th century and forwards. Stable prices: Switzerland pursues financial stability. Secure payments: National Bank trying to fulfill their functions and be resilient to potential shocks. Swiss Francs is part of the 5th most actively traded currency pairs. Trading Swiss franc against the USD, Euro are Sterling are the most popular among online forex traders. The Swiss Franc is traded freely under floating exchange rate. Below are some common notes and coins from Switzerland.